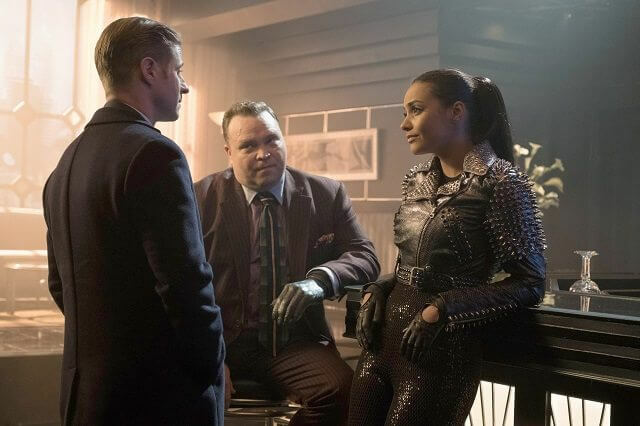 Fox’s Gotham season three episode 17 features a couple of major reveals, a few backstabbings, and the short-term partnership between two enemies. The May 8, 2017 episode begins with Oswald Cobblepot (Robin Lord Taylor) trudging through the thick snow, leaning on a walking stick as Ivy (Maggie Geha) carries a trunk. They make it to a deserted laboratory and it’s colder inside than outside, but its occupant Victor Fries/Mr. Frost (Nathan Darrow) prefers it that way. Mr. Frost isn’t happy to see Oswald, since it was Oswald who ran the freaks out of Gotham. And when Oswald offers to help reverse the experiment, Mr. Frost is justifiably skeptical. Besides, Mr. Frost doesn’t have his suit because it was locked away inside Wayne Enterprises. Wouldn’t you know it…the trunk Ivy lugged through the snow contains Mr. Frost’s suit. Jim Gordon (Ben McKenzie) meets with Kathryn (Leslie Hendrix), and she’s fully aware he knows Frank murdered his father and that’s why Jim killed his uncle. The big question is whether Jim holds the Court of Owls accountable. He doesn’t, and Kathryn wants him to be a part of the Court. She warns him that he’ll be called upon in the future to prove his loyalty. Lee (Morena Baccarin) hands photos of Frank’s dead body to Harvey Bullock (Donal Logue), and as she asks about Jim, he walks into Harvey’s office. They break the news Frank’s dead and Jim doesn’t seem upset. Lee’s confused he’s taking it so well and thinks he’s hiding something. She storms out of the office and then Harvey wants the truth. Jim explains what went down and recounts the details of his conversation with Kathryn. Harvey’s worried they need to act faster because of the weapon, but Jim doesn’t want to push too hard. Kathryn told him to go to work and act normal and that’s what he’s going to do. Harvey shows him a headline that reads, “Riddler Strikes – Robs Three Banks in One Night.” That should keep Jim busy. Barbara (Erin Richards) heads over to Edward Nygma’s place because he’s been blowing her off. 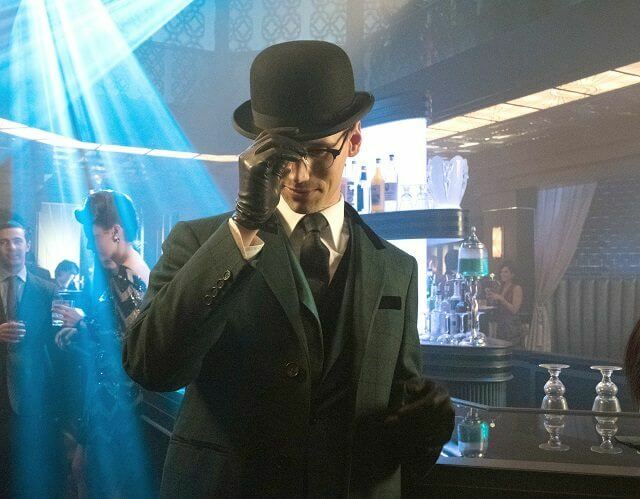 He (Cory Michael Smith) enters the room and tells her his name is now The Riddler, laughing. Barbara’s there to find out about the mysterious group that supposedly controls Gotham because she doesn’t like competition. She reveals Jim is the one who told her about the group and about a shipment delivered to Dock 9C which turned out to be a crate from Indian Hill. She has no idea what’s inside because an assassin killed her men before she could get a look inside. Ed remembers that Professor Strange mentioned a powerful group while he was at Indian Hill. He doesn’t know anything about the group but promises to find out the answers. Ed says he needs to speak to Gotham’s elite, which means he’ll have to attend opening night at the theatre. The Riddler takes over the production of Hamlet, striding onto the stage and demanding answers. He threatens to kidnap and torture one of the rich members of the audience this very night, and instructs them to spread the word The Riddler is coming. He then gives a negative review to the star of Hamlet, stabs him with a sword, and takes a bow. Over at Wayne Manor, fake Bruce (David Mazouz) plays a game of chess with Alfred (Sean Pertwee), and Alfred wins. He quickly figures out Bruce let him and wants to know why Bruce hasn’t been himself lately. Alfred wants Bruce to confess what’s up, and he says it’s because Selina said she never wanted to see him again. He doesn’t want to talk about it and Alfred understands, telling him time will heal the wounds. Fake Bruce thanks Alfred, calling him a good friend. After Alfred leaves to work on dinner, Bruce develops a nose bleed. Jim and Harvey investigate the crime scene at the theatre which includes two dead bodies and a mysterious green box with a question mark on its sides, tied neatly with a ribbon. Inside, there’s a riddle on parchment. The riddle describes Penguin, but it also could be describing recently restored Mayor Aubrey James. They think The Riddler’s going to make a show of grabbing the Mayor and call his office to warn him. Later that evening, Tabitha (Jessica Lucas) tries to convince Barbara they don’t need The Riddler. Barbara promises, again, that after he discovers the identity of the secret society, they’ll get rid of him. The Riddler sneaks up on them as they’re talking at the bar of Barbara’s crowded club. He reveals he’s going to kidnap the Mayor, but he also wants to embarrass the police when he does it. Barbara wants to know what he’ll do if the Mayor doesn’t know anything, and The Riddler says he needs a bomb to detonate at a biker bar at a specific time later tonight. When Tabitha asks how he’ll get the Mayor now that he warned the GCPD, The Riddler smiles and says they’ll bring the Mayor to him. The Mayor’s not sure the riddle is about him, but he thinks he’s safe with his own bodyguards and doesn’t need Jim or Harvey’s protection. He’s munching on danishes from a thankful citizen and suddenly feels the effects. He needs his pills for his blood sugar but The Riddler’s taken them. Ivy and Penguin continue their recruiting drive, visiting Bridgit Pike/Firefly (Camila Perez) at work. She’d rather stay at her current job than join them because she doesn’t want to return to Gotham. Ivy convinces her they’re all freaks and belong together as one big freaky family. Fake Bruce goes to Kathryn’s to get his nose bleeds looked at. After he’s examined, he learns he’s dying. Kathryn assures him the real Bruce Wayne will be back before he’s dead. Even with the death sentence, he’s happy Kathryn and the Court of Owls gave him a purpose after he left Indian Hill. He believes lots of people will die once Bruce is back – maybe even Alfred – and he seems concerned about that, which worries Kathryn. He claims he’s not attached to Alfred, and Kathryn reminds him Gotham must fall no matter what. The Mayor’s rushed to the hospital and they realize The Riddler’s likely already there. Just then The Riddler’s voice comes over the PA system and they hear shouting and gun shots. Jim barges into the communications room but it’s only a tape recorder playing a pre-recorded message. Jim calls down to Harvey who’s with the Mayor and lets him know The Riddler’s after information on the Court of Owls. Victims of an explosion are wheeled past Harvey as he talks to Jim, and Jim knows this is also part of The Riddler’s plan. Jim races back to the emergency room but he’s too late. A fight broke out between the police and bikers, and Harvey stepped in to break it up giving The Riddler an opportunity to grab the Mayor. Jim shows up at Barbara’s club, but Butch and Tabitha claim she’s not there. Jim tells them he knows she’s working with The Riddler and that it has to do with Dock 9C. Jim can’t believe they’d defend Nygma after he hurt them both and assures them if they reveal Nygma’s whereabouts, they’ll take him down but won’t come after Barbara. Tabitha and Butch exchange looks, but continue to insist they don’t know where he is. Jim gets a call about another riddle and warns them nothing better happen to Barbara. After Jim takes off, Butch tells Tabitha she should have given up Nygma. Tabitha says she couldn’t betray Barbara. The Mayor tries to convince The Riddler and Barbara they’re in over their heads. That only serves to make Barbara and Ed more interested in the secret group. The Mayor finally reveals the group is called the Court, and Ed’s happy he has real evidence such a group exists because now he’ll expose them. Tabitha shows up with a collar Ed requested, whispering to Barbara that Jim stopped by and knows everything. Fake Bruce pays a visit to Selina (Camren Bicondova) and she immediately picks up that he’s acting weird. He tells her he can’t stay away from her and then admits he’s not Bruce. Lee delivers the news there was something weird about Jim’s uncle’s autopsy. The real bullet that killed him was replaced with a different one, so she assumes someone was covering up a murder. Jim warns her to drop it but she isn’t about to give up this investigation, threatening Jim that he’ll pay for whatever he did. After Lee storms off, Harvey calls Jim into his office and hands him a new riddle that reads: “You can see me but you can not touch me. The flick of a switch I enter your home. Another I leave you alone. What am I?” Jim figures out its television and when they turn it on, The Riddler’s holding the Mayor hostage on live TV. Jim gets a call from Kathryn who explains the Court can’t be exposed and informs him they’ll clean this up. Kathryn’s pulling in her marker, telling Jim he needs to prove his loyalty by locating The Riddler and bringing him directly to her. If he doesn’t, Jim is no longer invited to be a part of the Court of Owls. Jim and Harvey debate their options as The Riddler yells into the television camera. The Mayor informs The Riddler the Court will kill him as they don’t make bargains. Jim’s decided on his course of action and calls The Riddler, saying he’ll tell him about the secret group if he comes to the GCPD. The Riddler agrees to come in, but it must be just the three of them. They clear out the station and the Mayor shows up still wearing the collar rigged to blow up. Ed enters after making sure they’re alone and Jim suggests Ed should just blow up the Mayor. Ed pushes the trigger on the remote but nothing happens, and Jim reveals Tabitha helped jam the signal. She told Jim how to disarm the bomb, and Ed shrugs that off and gets back to his demands. Jim tells him to let the Mayor go free and he and Ed will take a ride. Ed agrees, and the Mayor flees. Fake Bruce explains what happened and Selina can’t understand why he did what this strange lady said to do. He warns her that something terrible is about to happen and she needs to get out of Gotham. She demands to know what he did to Bruce, and fake Bruce assures her nothing bad will happen to him. She doesn’t trust him and tries to leave to tell Alfred, but he says she isn’t allowed to tell anyone – not even Alfred. Fake Bruce also admits he’s telling her because she’s the only one he cares about saving. “That’s the difference between you and Bruce Wayne. He would try to save everyone,” replies Selina. “You can pretend all you want but you will never be him. You’re nothing.” Fake Bruce says she’s wrong and she can’t tell Alfred. He pushes her from the window and she lands on the street below. She doesn’t move and her eyes are open, staring at nothing. Jim and The Riddler have a chat in the car about their double dinner date months ago while waiting for Kathryn. Jim confesses he had a good time and considered Ed a friend. Ed believes every friendship ends in betrayal, so he doesn’t care about having friends. Kathryn’s limo pulls up and Ed willing approaches her and one of her henchmen. He wonders how he knows for sure she’s part of the secret group, and to prove she’s who he’s searching for, she tells him she has the answer to the question he had to ask Bruce Wayne and Lucius Fox in Indian Hill. Ed smiles, accepting she’s for real. She invites him into the limo and tells him all his questions will be answered. Before they drive off, Kathryn tells Jim he’s made them proud. She also reveals they’ll find something for Ed to do. Barbara’s not happy when she makes her entrance at the club, angry Jim took down Ed before they could learn about the Court. Tabitha admits she helped Jim out because Barbara lied to her about letting her kill Ed. Oswald arrives home and Firefly and Mr. Freeze nearly come to blows before they’re calmed down. Oswald’s in a rotten mood and it doesn’t improve when the news comes on announcing The Riddler escaped police custody after unsuccessfully attempting to kill the Mayor. Selina is still lying exactly how she landed when cats begin gathering by her body. Jim is brought into a meeting of the Court of Owls, and each member is wearing an owl mask. He’s introduced and then picks up his own mask as he’s welcomed into the group.